Going into my first Pan American Championships, I did not quite know what to expect. For the past six years, I’ve heard stories from Sayaka about tournaments in Central/South America and her horror stories about the scales, the venue, the mats, etc. Therefore, I went into this trip expecting the worse; to my pleasant surprise, it wasn’t as bad as I had anticipated. The team arrived in San Salvador, El Salvador in the evening and was immediately greeted by the very warm and very humid weather. We were then escorted (lights and sirens) to the hotel, which felt like a resort! Supposedly, San Salvador is not a safe place to be so to ensure our safety, we were escorted everywhere. The tournament was held on April 9-10. I competed in the women’s 48 kilogram category on Saturday, April 10. My first round match was against my long time nemesis from Canada (Bianca Ockedahl). After the first 5 minutes with no score, the match went into overtime, where the first person to score wins the match. Halfway through the match I was caught for a score and lost the match. After my first round loss, I had to wait for Bianca to pull me though so I could have a chance to compete into the repecharge. She fought Mexico (the same girl I beat in Panama for 3rd only a few weeks ago) and wasn’t able to come away with a win. With that loss, I was eliminated from the tournament. Having such a short day I was ready to compete in the team tournament the next day to redeem myself. The team tournament had 7 women’s teams and 8 mens teams competing from the various countries the competed the previous days. 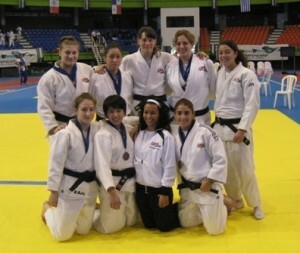 There were only 5 weight categories competing (-52kg, -63kg, -70kg, -78kg, Open). First round, the womens team fought Cuba (one of the top women’s team in the world). I did not fight this round because our -52kg girl wanted to get her hands on the Cuban who just recently placed 2nd in Beijing at -48kg. We did not win the round but was pulled through to fight in the repecharge. Second round, we fought Guatemala. The Guatemalan -48kg girl fought, so I was able to fight someone in my actual weight category. I pinned her about halfway through the match. Third round we fought Puerto Rico, where I had a walkover. Fourth round (fighting for 3rd place), we fought Argentina. The girl I fought choked out our -52kg the previous day fairly early in the match. I was very nervous, but once the match started, I was standing toe-to-toe with her. I fought hard for the grips and ended up winning by yuko. (Funny story:: About the last minute or so of this match, I was ahead by a yuko and all I had to do was grip to win the match (and obviously not get thrown). The previous weeks leading up to the tournament, at practice during randori I’ve been put in situations where I’m trailing and had to score or was ahead and just had to protect my lead. When I was ahead and had to protect my lead, Sensei would yell, “Match the intensity of the grips. Match the intensity of the grips!” So, with about a minute left in the match and ahead, all I had to do was protect my lead. The only thing I could hear was Sensei yelling in my ear, “Match the intensity! Match the intensity of the grips!” Needless to say, I matched the intensity and won). In terms of my competitive debut at the Pan American Championship, I definitely was not happy with my results but was satisfied with my progress in performance. Since Finland (November 2009), I’ve been working on certain movements and strategies. Here at Pan Am’s I saw the progress in my performance and I felt really good and confident that my training is paying off. Being able to see the progress in my Judo made me relatively happy. It just goes to show that all the ups and downs at practice is well worth it and makes me want to train even harder leading into Senior Nationals. After the tournaments were finished (the regular tournament and the team tournament) we went out on a team dinner to a fancy restaurant (again, kindly escorted by Police). It was located on a hill that overlooked the entire city. We could see the tournament venue and the hotel. It was beautiful! The dinner portions were a little on the small side so afterwards we were escorted to Wendy’s. Yes, Wendy’s!! My first Pan American Championships did not end the way I wanted. Nonetheless, it was a great experience that will prepare me for my next tournament experience. I wanted to thank everyone for helping me prepare for my tournaments and have helped me get to where I am today. Without you pushing and encouraging me, I wouldn’t be where I am today. Thank you.